Just a few years ago I would have dismissed anyone suggesting that I might one day read a book on a telephone as drunk, mad or foolish. Anyway, last Thursday I completed this slightly odd milestone when I finished off the latest part of Stephen Fry’s autobiography. I’d not turned a single page; it was all done through his MyFry app. Obviously an iPhone is not the perfect reading device. It is too small and when you’re constantly poking the three inch screen with your finger it just ends up getting in the way of the text. I imagine that a few of these problems will be sorted out on the iPad, Kindle and other eReaders. I just haven’t used them yet. Of course, you also miss out on the beautiful design features of a book. There’s no real cover (just a curious looking wheel) and there are no images to accompany the text. Still, there’s an introductory video, a number of tags let you navigate the narrative by topic rather than chapter and it’s satisfying to digitally check-off your progress as you go. A little more functionality would have made the app far better. Perhaps the ability to search, links to You Tube Videos, linked audio book and other extras. Perhaps they’ll be out in due course, in time for Christmas. As for a breezy review of the text, it’s a worthy read. Fry’s prose is rich and jangling, packed full of vivid metaphors, batty anecdotes and the occasional turn of jaw-swinging profanity. On one hand he is a relic of Edwardian England: instantly at home in his college rooms at Cambridge, a pipe smoking Wagner devotee who was unable (as was Hugh Laurie) to pronounce ‘hello’ in any other way than ‘hullo’. On the other, he is quite different. He writes about the insecurity that attended each subsequent successes – and at least once a chapter (or a tag if you like) he ends up doing his utmost to convince himself that he was on the verge of being ‘found out’ and carted back off to wherever he came from. And then there’s the ambition, the Macintosh, High Laurie, Rowan Atkinson, Robbie Coltrane, Emma Thompson, Ben Elton and almost everyone else who was connected, however delicately, to the British entertainment industry in the eighties. Throughout all, Fry seems to remain the barking comic who always ended up playing a king. So, a fine enough book that perhaps takes a little longer than it should to get going. 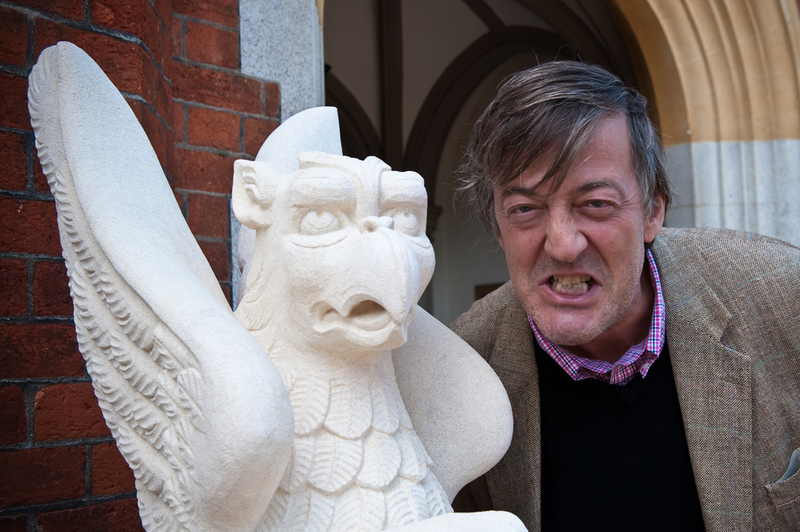 Here’s a video of Fry during this time – doing a bit of Dracula for the Footlights.